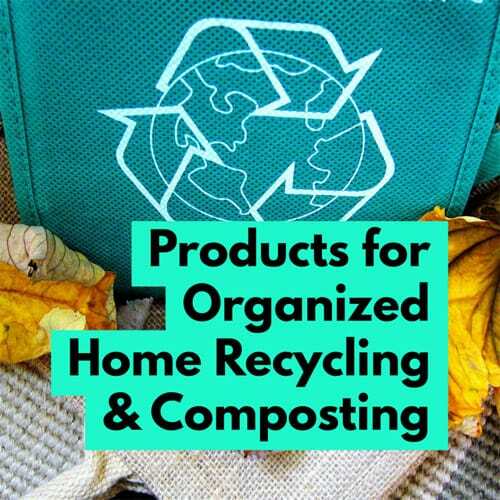 For a more detailed and personalized look at what will recycling products and systems work best for YOU and in YOUR home, feel free to contact me for a free phone consultation to discuss my virtual organizing sessions, available nationwide, or in-person organizing sessions in the Raleigh, North Carolina area. I really like the combination trash can and recycling bin – perfect for small spaces! Thanks for commenting! Yes, that combo bin is wonderful for small spaces. What excellent products you shared! I like that recycling bin with the handle. I bet that makes it easier to carry the container to the curb on recycling day. The color-coded wastebaskets are also a great idea to keep everyone in the family (or office) knowing where to put which type of trash. Thanks Linda! I use that recycling bin with the handle in my own home, it is wonderful! My town just began a food scraps recycling program. You can guy a bin from the town and drop the contents off easily. I have been surprised to see how it has taken off. Having the right container is very important to making it work well. You don’t want to smell rotting food all day long, right? It is great that your town is recycling food scraps. Yes, having the right container is so important when it comes to composting. Thank you for commenting. We started composting 2 years ago. It’s not as hard as I thought it would be and I can’t wait for my garden to benefit from our efforts this Spring. We have one of the counter top containers like in your post. Janet, that’s great! Thanks for commenting. What a great assortment of helpful products! I live in a city that provides each homeowner with an extra large recycling container that is even on wheels, so it is easy to cart to the curb. Thank you, I am glad you like these products. It is great your city provides you with a recycling container on wheels, they do the same in Raleigh.